So You Want To Start A Nursery? Welcome to StartANursery.com. This site is solely owned by Plant Delights Nursery Inc. Our intention is for this to be a FREE informational site providing connections to help those interested in getting into and growing in the nursery business. The links provided are not intended as endorsements, but merely a start for you to investigate further. The site only contains links for commercial nursery and greenhouse products. In most cases, we have linked to the product manufacturer instead of listing each distributor. Most manufacturers will be glad to provide you with a list of distributors or you can scroll down to our list of General Nursery Suppliers, each of which carry a wide range of products. If we have missed your business that targets commercial operations and you have a website, please drop us an email to info@startanursery.com. We reserve the right to refuse to link to any company site that makes us uncomfortable. 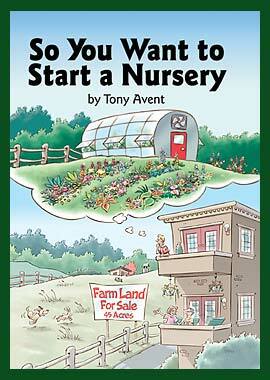 Tony's book, So You Want to Start a Nursery, published by Timber Press (www.timberpress.com), is now available. This comprehensive book touches on a broad range of issues that you will encounter as a prospective nursery owner. If you or someone you know has been thinking about the "n" word, save lots of time, money, and heartache by learning ahead of time what will be involved. Small nurseries looking to expand will also benefit from the detailed information. Topics covered range from selecting the type of nursery that you will start, selecting land, irrigation, writing a catalog, pricing plants, the effect of the nursery business on family relationships, handling employees, as well as marketing your plants. We think you will find this to be a thought-provoking information-packed book that fills a huge void in the practical how-to world of running a nursery. Click here to order your copy of So You Want to Start a Nursery. Good luck, and welcome to the nursery business.